This is the second part of Douglas’s three-part trilogy about his childhood, and generally the best known, though the whole thing has now been released on DVD. It’s black and white, stark, restrained, and depressing. I get the sense that there is a particularly Scottish brand of melancholy that Douglas’s film represents, but since my familiarity with Scotland encompasses Alasdair Gray, James Kelman, Postcard Records, and the Dog-Faced Hermans, I find it hard to draw any serious conclusions. 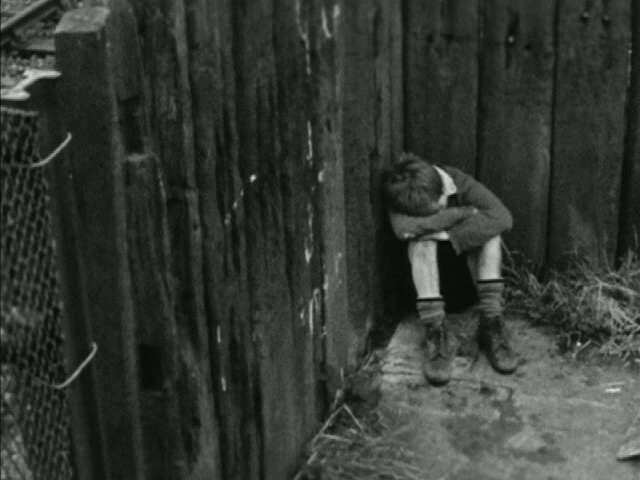 But I can’t believe that Lynne Ramsay didn’t have it in mind 25 years later when making her own excursion into dark Scottish childhood, Ratcatcher, a movie so dour I remembered it being in black and white even though it’s not. But though the experiences chronicled in My Ain Folk are ghastly and grotesque, the style is more remarkable than the content. Though our boy hero is oppressed, abused, and abandoned, there’s not much to distinguish his adventures from those of the young children of Pialat, Bresson, and Truffaut. But I don’t know of any English-language movie of the time with a style like Douglas’s. Though there’s some visual spillover from the Angry Young Men movies of John Schlesinger (Billy Liar and its run-down, dead village especially), Douglas goes for a much chillier and detached continental tone, and he’s remarkably successful. With next to no camera movement, he tends to shoot static tableaux from high and oblique angles. There’s minimal action, quite literally. Even when people are speaking, they do so holding themselves very still. So the movie reminds me of Bresson, of course, but also of Antonioni and Pasolini, even though the base material is drastically different. Bresson never shot such a filthy, working-class film. And Douglas adjusts his style to bring out the most of the cramped quarters he shoots in. The 4:3 ratio really helps this; this film and its visuals would not have worked in 16:9 at all, so I greatly credit Douglas’s eye. Its closest sibling might be the Vitali Kanevsky’s amazing Freeze, Die, Rise Again, which creates a similar claustrophobia around its wretched Siberian mining town. But Douglas shies away from the direct empathy that Kanevsky provokes, and so removes all catharsis and a great deal of apparent realism. I think this is an achievement, but it makes for a cold movie that resists easy empathy…which I assume was Douglas’s point. It shouldn’t be too easy to identify with or love the unfortunate–or else they wouldn’t be unfortunate. These characters are far harder to love than Mouchette or any of the Dardennes’ protagonists. I’m surprised the “slow film” aficionados haven’t picked up on Douglas yet (hi Lars! hi Steve! ), because I think Douglas deserves a place right up there with Tarr (there’s an uncanny similarity, in fact) and the rest. Douglas was indeed a major filmmaker. Have you caught up with the resto of Comrades? He’s firing on all cylinders in that one, including cylinders you wouldn’t know he had if your only experience with Douglas was the trilogy. It’s an epic that calls to mind a whole host of greats, from Jean Vigo to John Ford to Pontecorvo to Watkins. His trilogy is available on YouTube surprisingly enough. The film does not seem “slow” like Tarr or Antonioni, there is a lot of fast cutting and what seems to be subliminal imagery like a silent movie, but it does have the texture and starkness of the movies made by those guys. It was pretty good.